- Correspondence of the AJB : between the leading committee and local committees, between local committees, between the AJB and German or Belgian officials, between the AJB and Suisse, German, French and Dutch organisations, etc. - Lists : e.g. employees of the AJB, Organisation Todt workers, Jews who received a convocation for forced labour (Arbeitseinsatzbefehl), packages and letters delivered to the Dossin barracks, etc. - Documents of the subdivisions responsible for education, interventions, “Aide Spéciale Malines”, social welfare, emigration, etc. - Correspondence and documents regarding the activities of the “Aide Spéciale Malines” department. - Financial files and accounting : salaries of the Organisation Todt workers, clearings, liquidations, budget, financial gifts, membership fees, etc. SCHREIBER Jean-Philippe and VAN DOORSLAER Rudi (ed. ), De curatoren van het getto. De Vereniging van de joden in België tijdens de nazi-bezetting, Tielt, 2004. / SCHREIBER Jean-Philippe & VAN DOORSLAER Rudi (ed. ), Les curateurs du ghetto. L'Association des Juifs en Belgique sous l'occupation nazie, Bruxelles. / Non-published inventory of Fonds Beeckmans by dr. Lieven Saerens, Cegesoma. A rudimentary inventory on file level is available upon request. The archive of the Association of Jews in Belgium (AJB) was physically divided into three units during and after the war. A copy of the original membership forms is now part of the Fonds Beeckmans, stored at the Cegesoma in Brussels (KD_00009). The files of the AJB Service Special Assistance Mechelen (Dossin barracks) were in 1944 seized by the Belgian resistance, (Independent Front), were stored at the Nationel Museum of the Resistance (NMR) in Brussels and are now stored at Kazerne Dossin (KD_00011). The remaining organisational files of the AJB were stored by the "Centre National des Hautes Etudes Juives - Institut Martin Buber", before being transferred to the Jewish Museum of Deportation and Resistance (KD_00010). The JMDR has digitised all three collections and thus tries to digitally restore the original AJB archives. From October 1940 until May 1942 the Nazis implemented 17 anti-Jewish measures in Belgium. The Association of Jews in Belgium (AJB) was established by decree of the Militärverwaltung (military administration) on 25 November 1941. All Jews in Belgium were obliged to affiliate as members. Officially, the tasks of the AJB included promoting emigration, Jewish education and social welfare. In reality, it was a Jewish instrument controlled by the Nazis which assisted in the genocidal deportation of Jews from Belgium to Auschwitz-Birkenau. The AJB was composed of a leading committee established in Brussels, four local committees in Brussels, Antwerp, Liège and Charleroi (cities with 2,000 to 35,000 Jewish inhabitants each), and smaller local bureaus in Ghent, Ostend, Mons and Arlon. The leading committee counted seven members of which five were Belgian Jews, so the composition was not representative of a Jewish population which was composed for 94% of foreigners, mainly Poles and Germans. In February 1942, the Nazis ordered the AJB to identify the Jewish population. In March this census was used to draft Jews for forced labour and in July the Sicherheitspolizei-Sicherheitsdienst (Sipo-SD) ordered the AJB to provide the names of 10,000 Jews for a so-called convocation for forced labour (Arbeitseinsatzbefehl), in reality the genocidal deportation to Auschwitz-Birkenau. The AJB, responding with zeal, provided the Sipo-SD with 12,000 names. The trap, however, failed: only 4,000 Jews reported at the Dossin barracks in Malines, the SS-Sammellager für Juden. The AJB evoked distrust and resentment among the Jewish population and became the target of Jewish resistance. At the end of July 1942, Jewish partisans attacked the offices of the Association and on 29 August 1942, one of the leaders of the forced labour service for Jews was shot. Confronted with the failure of the convocations for forced labour, the Sipo-SD organised massive raids from 15 August until 21 September 1942. In response to these mass arrests, the local AJB committee in Charleroi, infiltrated by communist resistance, scuttled at the end of September 1942. After a short internment in the Breendonk camp for political prisoners, Salomon Ullmann, military chaplain and Chief Rabbi of Belgium, in October 1942 stepped down as president of the AJB. Maurice Benedictus, administrator of the AJB, fled to Portugal in December 1942. By then more than 16,600 Jewish men, women and children had been deported. From then on, the fundamental role of the AJB was limited to social assistance, interventions with the occupier and a special service in charge of helping the prisoners at the Dossin barracks. In Liège, the local committee ceased to exist at the end of April 1943, when its leaders were deported. Some of them were working illegally in the Jewish Defence Committee (CDJ). 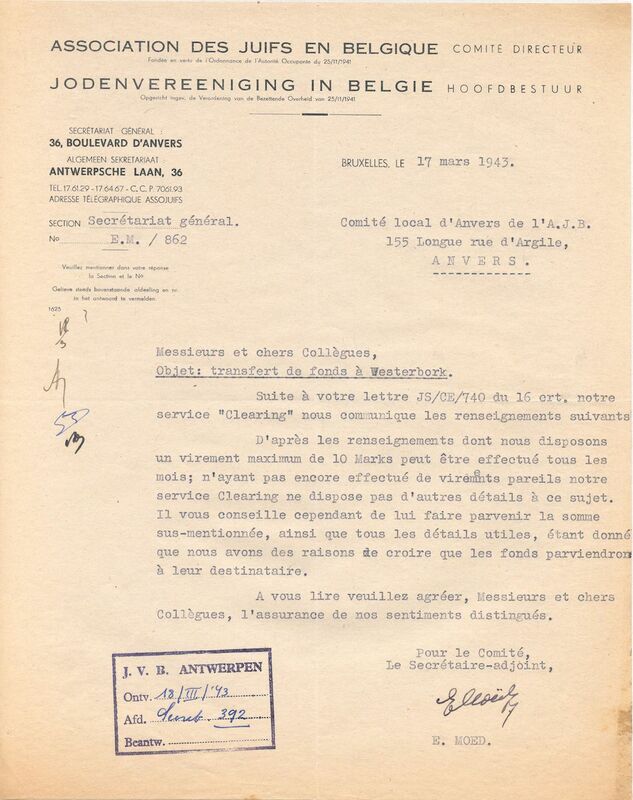 In September 1943, the Sipo-SD eliminated the Antwerp AJB committee, deporting its members together with the remaining Jews of Belgian nationality from Antwerp, leaving the city without any officially organised Jewish life for the rest of the occupation. In Brussels, the AJB functioned until the last day of the occupation. Several of its members (Maurice and Esta Heiber, Chaim and Fajga Perelman, David Ferdman) were secretly working for the Jewish Defence Committee. They helped rescue Jewish children until the Liberation of Belgium. The Association of Jews in Belgium (AJB) created these files while carrying out its duties from 1941 until 1944. After the Liberation, resistance fighters of the Front de l’Indépendance (Independent Front) visited the offices of the “Aide Spéciale Malines” department of the AJB, located at 56 Boulevard du Midi in Brussels. The Front de l’Indépendance confiscated a large part of the files stored at the office and later on donated these to the National Museum of the Resistance (NMR) in Brussels. In 2000-2001 the NMR transferred the files to the Jewish Museum of Deportation and Resistance, predecessor of Kazerne Dossin, which organized, archived and digitized all the files.